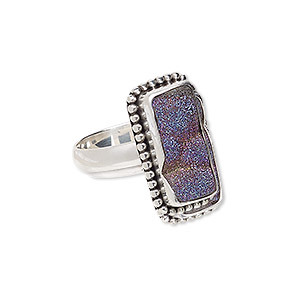 Ring, electroplated druzy agate (coated) and imitation rhodium-plated brass, purple, hammered band with 24x18mm-27x21mm hand-cut freeform, adjustable. Sold individually. Item Number: H20-7019JD Have a question about this item? 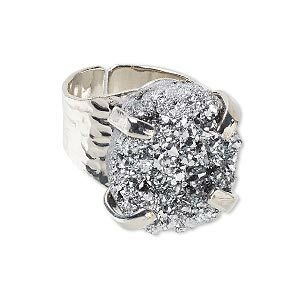 Imitation rhodium-plated brass cocktail-style ring with hammered band features a hand-cut freeform druzy agate gemstone with an electroplated finish. It's an affordable fashion statement suitable for any attire. 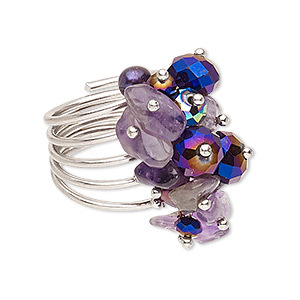 Adjustable ring is ideal for over-the-counter sales or as a quick on-the-go accessory. Sizes, shapes and colors may vary with handcrafted items. 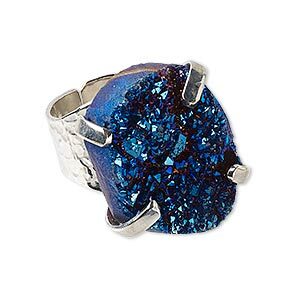 Ring, electroplated druzy agate (coated) and imitation rhodium-plated brass, blue, hammered band with 24x18mm-27x21mm hand-cut freeform, adjustable. Sold individually. 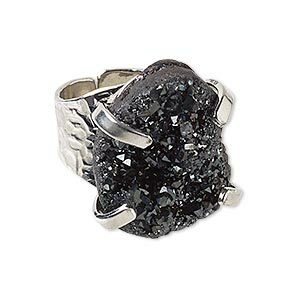 Ring, electroplated druzy agate (coated) and imitation rhodium-plated brass, black, hammered band with 24x18mm-27x21mm hand-cut freeform, adjustable. Sold individually. 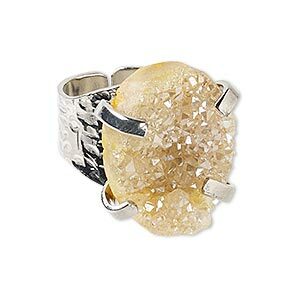 Ring, electroplated druzy agate (coated) and imitation rhodium-plated brass, champagne, hammered band with 24x18mm-27x21mm hand-cut freeform, adjustable. Sold individually. 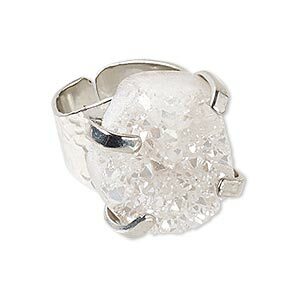 Ring, electroplated druzy agate (coated) and imitation rhodium-plated brass, white, hammered band with 24x18mm-27x21mm hand-cut freeform, adjustable. Sold individually. 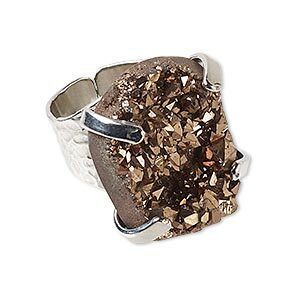 Ring, electroplated druzy agate (coated) and imitation rhodium-plated brass, brown, hammered band with 24x18mm-27x21mm hand-cut freeform, adjustable. Sold individually. 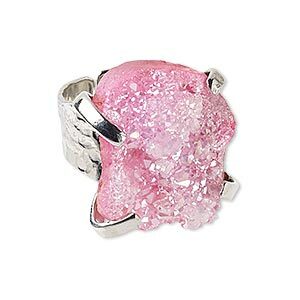 Ring, electroplated druzy agate (coated) and imitation rhodium-plated brass, pink, hammered band with 24x18mm-27x21mm hand-cut freeform, adjustable. Sold individually. Ring, electroplated druzy agate (coated) and imitation rhodium-plated brass, silver, hammered band with 24x18mm-27x21mm hand-cut freeform, adjustable. Sold individually. Ring, amethyst (natural) / cultured freshwater pearl (dyed) / glass / imitation rhodium-finished steel, purple and metallic purple, 19mm wide, size 7-1/2. Sold individually. 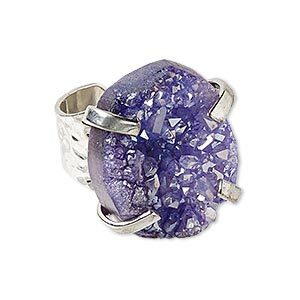 Ring, druzy agate (coated) and antiqued sterling silver, purple AB, 22x12mm beaded rectangle with 18x9mm rectangle, size 8. Sold individually. 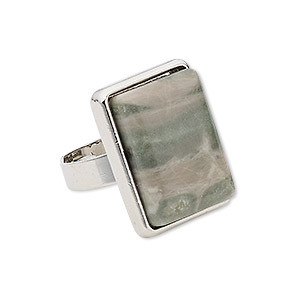 Ring, green line jasper (natural) with silver-plated steel and "pewter" (zinc-based alloy), 24x18mm-24x19mm rectangle, adjustable from size 5-9. Sold individually.